One of Victorian England’s most famous philosophers harbored a secret: Herbert Spencer suffered from an illness so laden with stigma that he feared its revelation would ruin him. He therefore went to extraordinary lengths to hide his malady from the public. Exceptionally, he drew two of his closest friends—the novelist George Eliot and her partner, G. H. Lewes—into his secret. Years later, he also shared it with a remarkable neurologist, John Hughlings-Jackson, better placed than anyone else in England to understand his illness. Spencer insisted that all three support him without betraying his condition to others—and two of them did so. But George Eliot, still smarting from Spencer’s rejection, years earlier, of her offer of love, did not. Ingeniously, she devised a means both of nominally respecting (for their contemporaries) and of violating (for our benefit) Spencer’s injunction. What she hid from her peers she reveals to us in an act of deferred, but audacious literary revenge. It’s here decoded for the first time. Indeed The Complicity of Friends comprises the first disclosure of Spencer’s hidden frailty but also, more importantly, of the responses it generated in the lives and works of his three notable friends. This book provides a complete rethinking of its principal figures. The novelist who emerges in these pages is a more sinuous and passionate George Eliot than the oracular Victorian we are used to hearing about. The significance of the friendship between Lewes, her irrepressible partner, and the inventive Hughlings-Jackson is outlined for the first time. And in an ironic twist, even his three farsighted confidants could not anticipate that, late in the twentieth century, certain of Spencer’s own intuitions about the nature and provenance of his illness would be vindicated. Those with any interest in George Eliot, Lewes, Hughlings-Jackson, or Spencer will be compelled to re-envision their personalities after reading The Complicity of Friends. Martin N. Raitiere is a practitioner of general adult psychiatry in Portland, Oregon. 2. 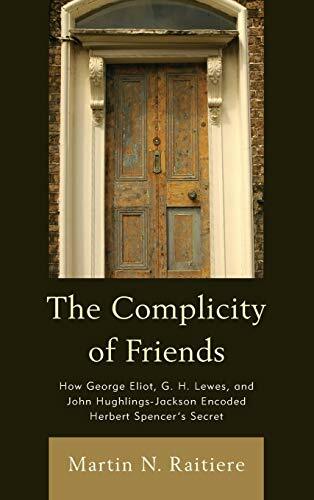 The Complicity of Friends: How George Eliot, G. H. Lewes, and John Hughlings-Jackson Encoded Herbert Spencer's Secret [Hardcover] [Nov 13, 2013] Raitiere, Martin N.